MV Agusta’s new Turismo Veloce 800 has a great moniker. But can it live up to it? Al finds out in France. What’s in a name? When it comes to motorbikes, generally not very much. An alphabet soup of letters and numbers, with lots of ‘R’s (for Race! Or Road. Or something…), ‘X’s (for eXtreme!!?? ), and ‘F’s (for flat). Then the manufacturer’s chosen code letters: CB, GS, YZ, Z. Even when a bike does get a name, it’s often abject nonsense. FireBlade, Ninja, Monster, Brutale, forsooth! Even trying to explain some of them to a non-biker is embarrassing. Perhaps surprisingly, MV Agusta’s new bike has one of the most prosaic, Ronseal-ish names around. ‘Turismo Veloce’ – that’s Italian for ‘Fast Tourer’. On the face of it though, there are a couple of problems with that. Firstly, ‘fast’. The touring class has a wide range of bikes at the top end, with engines from 1,000 to 1,600cc, often four-cylinders. So a three cylinder 800cc motor is going to struggle, surely? Secondly, ‘tourer’. MV Agusta does many things well, and very few of them come under that heading. Hard-edged, high-bhp motors, super-taut track suspension, aggressive riding positions, and no room for pillions, or bungee cords: that’s the usual fare from Varese, and we love them for it. So, this new bike may have a tough job to impress. They’re not daft at MV though, and at the press conference before we rode the new bike in Nice, France, they had plenty of answers. 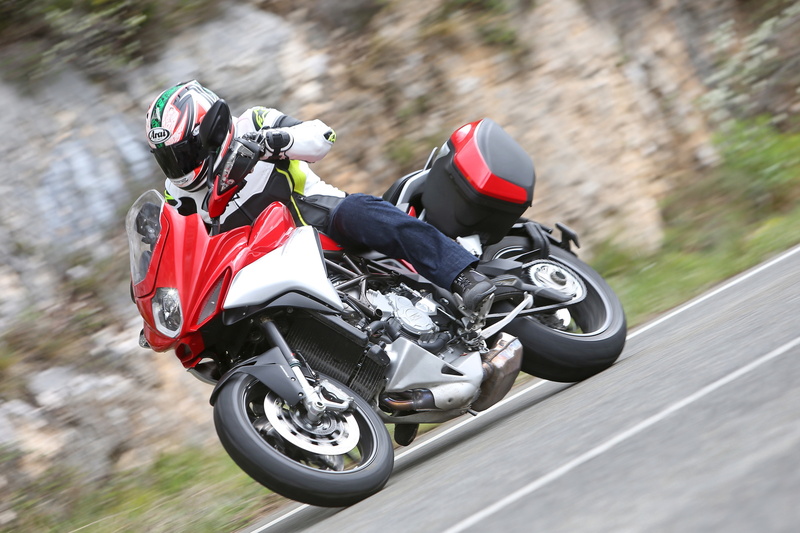 Yes, the Turismo is 50bbhp down on the Ducati Multistrada (another bike with a sensible name – ‘all roads’). But it’s also 18 kilos lighter. The BMW R1200GS is just 15bhp stronger, and carries a hefty 28kg more. It’s shorter, sharper, lighter, and more nimble than its big-bore competitors, is the line here. On the touring front, MV designer Adrian Morton explained how he’d pulled out all the stops to give the Turismo Veloce (can we call it the TV800?) plenty of touring props, while retaining decent performance. Much of this centres around the latest generation electronics: the TV800 has a super-smart central brain that incorporates ABS, Traction Control, variable power and throttle maps, as well as an up- and down-quickshifter. It even links its gorgeous colour LCD dashboard with your Bluetooth gadgetry. The top-spec ‘Lusso’ version adds electronic semi-active Sachs ‘Skyhook’ suspension, a GPS sensor for datalogging, heated grips and a centre stand. 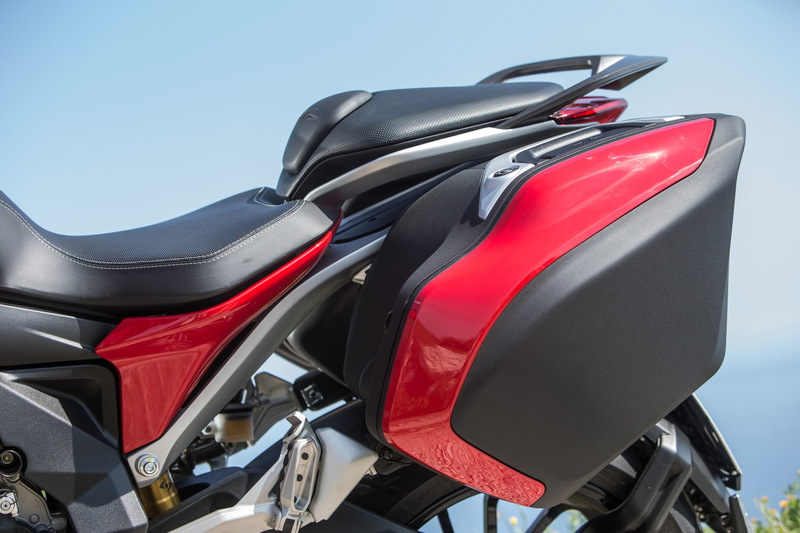 Away from the trick bits, Morton was justifiably proud of his panniers: both hold 30 litres, both take a full-face lid, and yet they’re cunningly tucked-in, so the total width of the back end is still narrower than the handlebars. They also look very much part of the bike, rather than tacked-on bulky square boxes. Plus – the back end looks fine when they’re removed too. Smart. So – as we left the Agusta Spin Room for dinner and bed, the message from Varese was clear: MV reckons this is a properly-sorted, sporty, adventure-style touring bike. And with a 250km ride planned for tomorrow, we would get a chance for some decent mileage. Next morning, we’re up bright and early, and a bit sick to see damp roads and mist on the hillsides behind Nice. It was 22 degrees in London only 48 hours beforehand, surely the gods wouldn’t rain on my jacket-and-jeans parade? Thankfully no, and the skies are brightening as we hop on the silver and silver/red Turismos parked outside the Grand Hotel St-Jean Cap Ferrat. I’ve still got very fond memories of the Agusta Stradale 800 we tested back in November last year, and on the face of it, the TV800 should be pretty similar. And indeed, the riding position is clearly in the same ballpark, albeit with more space in the seat department, and a larger cockpit. 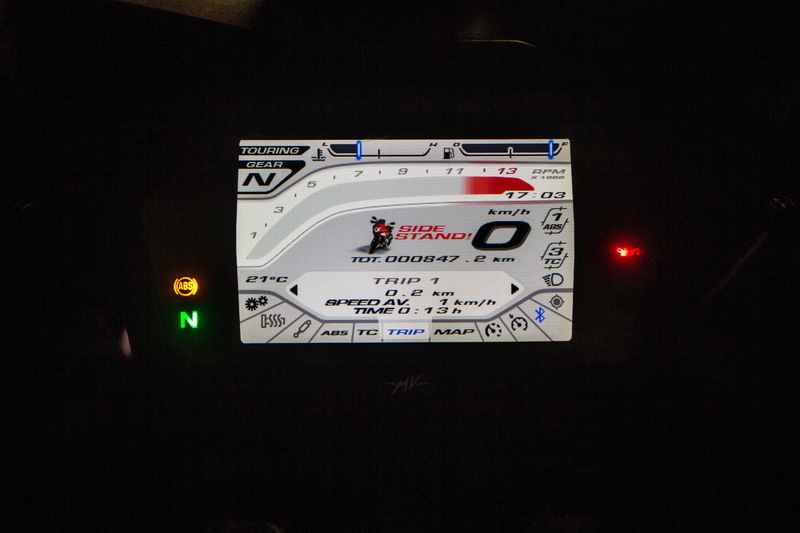 MV’s tweaked the controls for the ECU menus, and that, together with the clear, colour screen, makes selecting ‘Sport’ mode, turning down the traction control to ‘2’ (of 8), and switching to MPH from KPH all very easy. I’m less sure of the touring abilities of my perch though: the screen is still on the small side, and with only a half fairing, you’re short on the wind and weather protection afforded by ‘proper’ heavyweight touring machines. Now, we’re off, following the Agusta test rider through Nice and out into the Maritime-Alps behind the city. Gently Bentley to start with, but we soon leave the Bentleys (and Bugattis, Porsches and Maseratis) of Nice behind, and the pace quickens. We’re the last group on this launch, so the test rider leading us out has had plenty of time to get to know the route, and when pushed, he properly pulls the pin. The first section is super-tight and twisty, and the Turismo is in its element. The engine has been retuned, dropping peak power down to a still-decent 110bhp, and giving a hefty chunk of midrange oomph. It feels super-strong, with a real thump in the pants when you slam the gas on out of a bend, or to overtake Pierre in his asthmatic Peugeot 305. Once the traffic thins out, we get into a real rhythm: gas, brake, turn, gas, brake, turn, all the way up the mountain roads towards Colomars and Vence. It’s invigorating stuff, and the Agusta thrives on it. The ABS and TC safety nets add confidence when the asphalt starts to look shady, while the quickshifter is a boon for the countless cog swaps between bends. 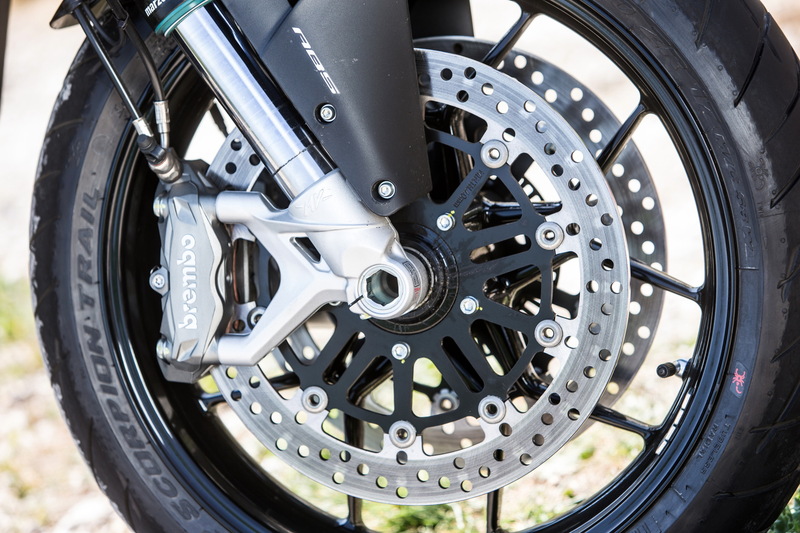 Brembo brakes are strong, progressive and feel-laden, and the steering is sharp, direct. If I’m being picky, the standard suspension settings aren’t at their best here though.There’s a fair bit of movement when you get on and off gas and brake, and while it doesn’t get in the way, it’s just adding extra stuff for you to think about when pushing on. Some fiddling with the adjusters would make an improvement of course, as would the electronic suspension system of the ‘Lusso’ version (which we’re not riding today, sadly). While we’re on the subject, the long travel seems a bit superfluous on this bike. Sure, I know adventure bikes are all the rage, and machines like the Multistrada and R1200GS are amazing to ride. But I reckon MV could have got away with something a bit more road-biased (should I say Yamaha MT-09?). As it is, the TV is a bit on the tall side for me, with an 850mm seat height. Admittely, I’ve got short legs, but I’m far from dwarvish at 5ft 8in. One (not short) journo managed to topple over during a ‘U’ turn, caught out by the road camber and high seat. I suspect part of that is about packaging the underslung exhaust, and the clever panniers. Nevertheless, I’d have liked a lower, less trailbike aspect in what is, after all, pretty much a 100 per cent road bike. Ditto the tyres: Pirelli Scorpions are top adventure tyres, but a ‘proper’ sporty touring road tyre will, all things being equal, work better on the edge. Still, we are where we are. Which is on a damp, patchily-repaired French mountain road, egging on a factory-spec MV test rider, and loving every minute. Even when the road comes down into the valley, opening out and becoming faster, sweepier, more deadly, the Agusta is still ticking all the boxes. That engine pulls and pulls, making you feel like you’re doing 120mph when you’re doing, well, about 110mph actually. If all this sounds a bit, er, sporty, then you’re right. The TV is a properly lively piece of work, feeling more like a strong 600 supersports bike than a big, lumbering touring bike. Indeed, I was reminded of Triumph’s 675 Daytona triple engine in the way the Agusta ripped through the midrange. 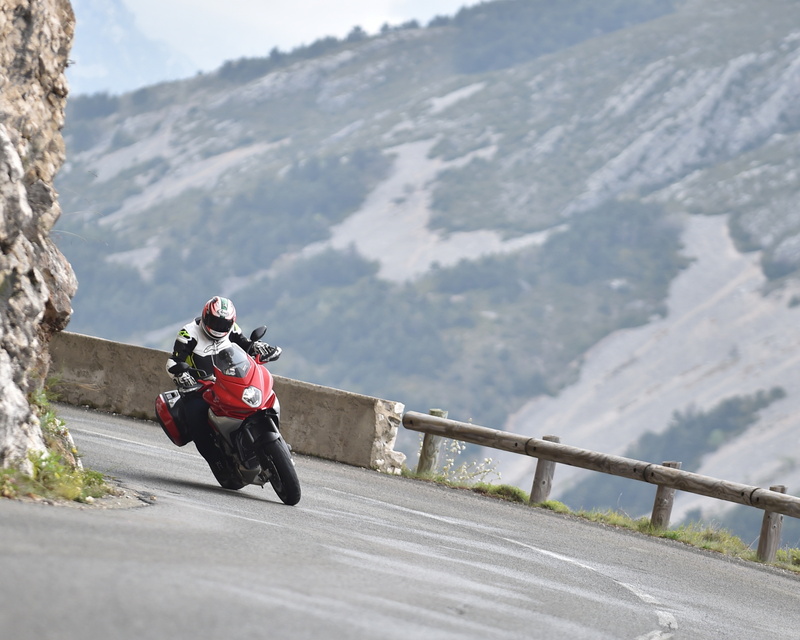 And in the same way as the larger Multistrada, it lets you attack a wider range of roads than you could on a pure sportsbike, with only slightly less in the way of engine and chassis performance. It’s ticking the ‘Veloce’ part of its name and no mistake. So what about the ‘Turismo’? Well, I’m less sure here. Part of the problem was MV didn’t include any motorway stretches in the planned route, so we didn’t get to sample its charms over, say, a 30-mile, 110mph Autobahn simulation. On the plus side, there’s a big 22 litre tank, which, together with the reduced fuel consumption of a smaller engine, will mean more miles between stops than many of its competitors. The electronics suite is excellent, with the cruise control, quickshifter and riding modes all making life easier. Add in some of the options, like the panniers, sat-nav, factory heated grips and centre stand, and you’re getting closer to touring nirvana. On the downside, that engine, so much fun with the twistgrip on the stop, has a hard-edged racey rort about it, and some vibes, which would maybe get to you after a few hundred motorway miles. The adjustable screen is still a bit small, and that, with the abbreviated fairing, means more wind blast and less weather protection, again, making (say) an autumn trip from London to Glasgow a bit more of a trial. Admittedly, I have some weird old-school prejudices when it comes to long distance touring. I like to have the biggest possible motor, with an enormous barn-door fairing, heated bars, seat, tunes with speakers, the whole nine yards. But then, when you get to the interesting bits at the end of your journey, the tables are turned on the heavyweight tourer in the twisty bits. 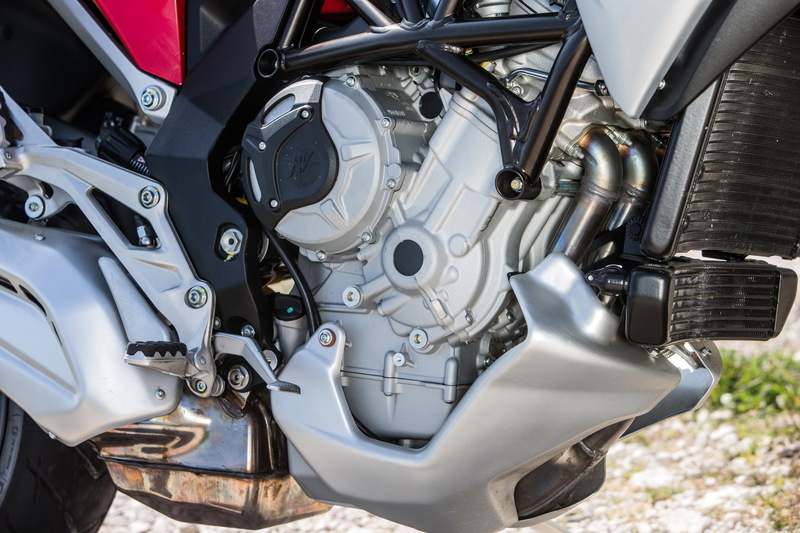 There’s been a fair bit of work gone into the retune of Agusta’s 800cc triple, dropping peak power down to 110bhp, compared with the 140bhp of the Dragster RR, say. There are new pistons, revised cams and cam timing, lower compression, plus altered intake and exhaust systems. The hydraulic clutch of the Stradale is here too, making the engine narrower, and Agusta’s also fitted its mechanical slipper clutch. Agusta’s also worked on extending the service intervals: services are at 15,000km (9,300 miles) and the major valve service is at 30,000km (18,600 miles). There’s a typical MV steel tube/alloy plate frame, tweaked to suit the sport touring brief. That means extra plates to take a centrestand mount, and a new rear subframe specially designed for the pannier mounts. The standard bike has fully adjustable ‘normal’ suspension – Marzocchi forks with separate damping legs (one compression, one rebound) and a Sachs rear shock. 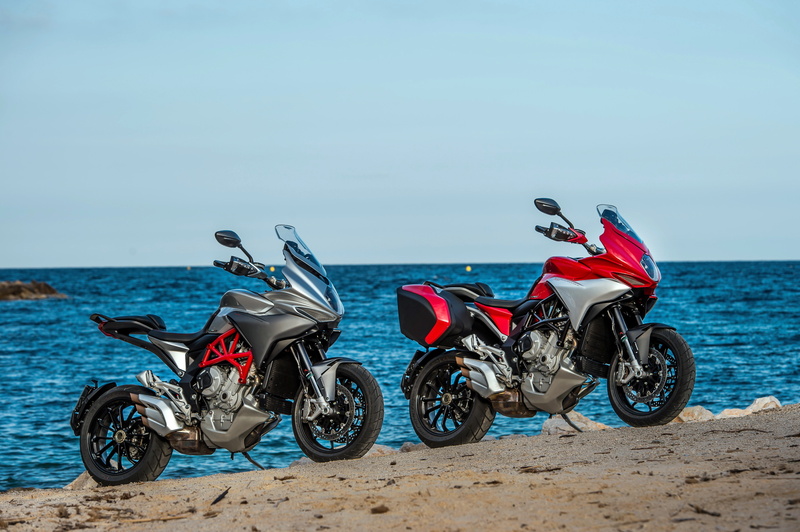 The ‘Lusso’ version comes with Sachs’ ‘Skyhook’ semi-active suspension, as also seen on the latest Ducati Multistrada. Full-spec switchable ABS, with anti-rear wheel lift, operates through Brembo radial calipers and 320mm discs up front. Short of a virtual kitchen sink, it’s hard to see what else MV could have added on the trick digital front. The ECU ‘brain’ includes cruise control, ABS, traction control, ride-by-wire, four riding power modes (sport, rain, touring and ‘custom’). The custom riding mode can be set up as you like, with a choice of power outputs, throttle snappiness, engine response, engine braking, hard or soft rev limiter and traction. You also get a slick up- and down- quickshifter, Bluetooth connection, and on the Lusso, GPS datalogging and the electronic suspension system. Full LED headlight, tail light and daytime running lights, full-colour TFT LCD screen, cruise control, twin 12v sockets and two USB charging sockets are all standard. Options include the panniers, integrated heated grips, Garmin satnav and centre stand. Buy the ‘Lusso’ version, and you get the grips, stand and panniers, as well as the Skyhook electronic suspension. 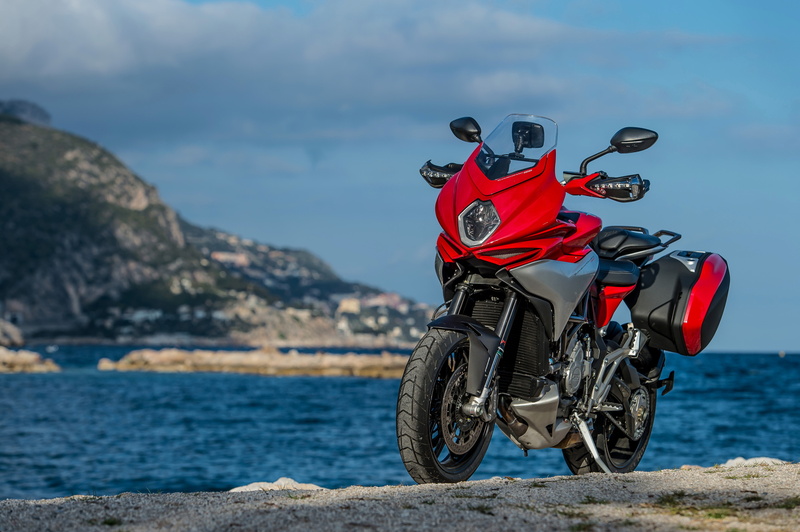 There’s a special introductory version called the Edition 1, which is limited to 150 worldwide and will cost £12,589 + otr in the UK.,It comes with centrestand, panniers, heated grips and sat nav and each has the late Claudio Castiglioni’s signature on. There are just 15 available in the UK (one per dealer). Standard bike available now, Lusso will be available in July. Quickshifter, downshift throttle blipper, eight-stage traction control, four torque maps, switchable ABS with rear wheel lift prevention.